Dolls house and scale miniature chairs often come with the wrong finish or upholstery for your vision of a model scene or display. If you have created a classic finish for your miniature furniture, you can also adjust the upholstery to suit your miniature scene. If you are unable to find an appropriate fabric, you can use EQ Printable Fabric Sheets along with some of the ​printable shop paper and fabric designs to create suitable miniature fabrics for upholstery. You can also needlework any of the small-scale patterns in the miniature needlework list to make a range of upholstery styles. Cardboard Seat and Cushion Templates If you are re-upholstering a piece, you may be able to reuse the existing templates for the upholstery. If not, you can see in the next step how to make templates for seat and back cushions. Thin Flexible Foam The foam used here is approximately 1/8 inch thick. You can substitute thin quilt batting, or packing foam sheets (as long as they are flexible with some give). Embroidery Thread if desired to finish edges and substitute for upholstery trim. 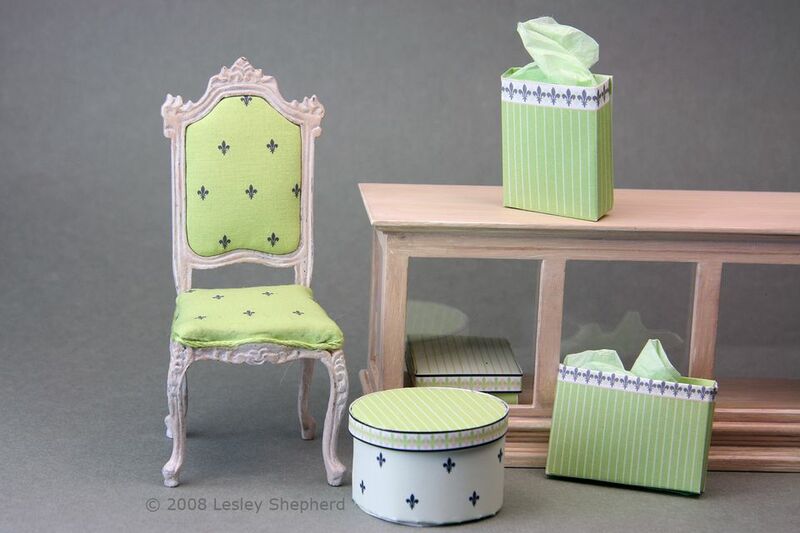 To make templates for your miniature upholstery, cut lightweight but firm cardboard (similar to the weight of cereal box cardboard) into cushion shapes as shown in the photo. The templates should be slightly smaller than the upholstered cushions will be. Fit the templates carefully in place once you have cut them out to make sure they are the correct size and shape. Using the cardboard templates from the original chair upholstery, or the ones you created in the previous step, cut rough fabric pieces to upholster your chair. Cut the fabric approximately 1/2 inch (1.25 cm) larger on all sides than the template. You do not need to cut trim the fabric to fit, just make sure it is larger than the template by 1/2 inch on all sides. Note that for some furniture, chair back upholstery will need to have the seams covered by another fitted piece of upholstery. Using the cardboard templates you created in step 3, cut pieces of thin foam slightly larger than the templates for the chair upholstery. Tracing the template on the foam, then cutting out on the line, usually makes the foam piece the correct size. Run a bead of glue around the front side of the template and glue the foam to the cardboard. Lay your chair upholstery fabric over the foam side of the template you created, setting your fabric so that lines or patterns run in the correct direction and are centered. Carefully turn the fabric, and foam covered template so that the fabric is face down on a clean work surface. Run a bead of glue along the most detailed cardboard edge of the template. Carefully glue the edge of the fabric to the cardboard template, making sure it fits tightly around any curves. Use the flat end of a glue spreading spatula to smooth out any curves and press the fabric into the glue. Pull the fabric tight on the side opposite the side you have glued. Run a bead of glue along the cardboard template and glue the second edge of the fabric in place, making sure the fabric is stretched over the foam on the front side of the cushion, and that the fabric pattern and grain continue to line up correctly. If your fabric needs adjusting, pull it free of the glue and line it up correctly. Trim any excess fabric, leaving approximately 1/4 inch glued to the cardboard. Run a bead of glue along the back side of the cardboard upholstery template on one of the two unglued sides. Fit the fabric over the edge of the template the same way you did for the first side of ​the fabric in the previous step, making sure the fabric is folded around to the back in a way that keeps wrinkles from forming on the front side of the upholstery. Glue the fabric edge in place. Trim it to 1/4 inch if necessary to remove some bulk. Carefully pull the final opposite edge of the fabric taut over the upholstery foam and template. Run a bead of glue along the inside of the remaining template edge, stretch the fabric over the edge and glue it in place on the back side of the template, trimming if necessary. Set the upholstered templates aside to dry. When the templates are dry, check the fit against the chair and glue the templates in place. Here the two-piece back cushion has been pushed through the back of the chair to check the fit. Only one side of this cushion has foam and that is on the side which is visible. The extra upholstered template shown beside the chair will be glued to the back of the back upholstery to finish the upholstery from the back and fit the entire piece neatly into the chair. Between ​creating classic wood finishes for miniatures and changes to upholstery, there are unlimited ways to express your creativity. Why stick with bland furniture when you can put your own creative stamp on it easily! Changes to the upholstery can link a chair to a setting in a dolls house, as well as make sets of furniture unique to your collection.